Gone are the days, when blogging was thought to be a hobby and used as a platform to share thoughts only. Today, it has grown into a mainstream profession for millions of people across the globe. Everyone from individual to businesses is doing blogging to achieve different goals. If you’re looking to start your blogging journey, but can’t figure out which platform you should go with, then you are in the right place! Probably you are confused between the popular CMS WordPress and user-friendly website builders. Well! 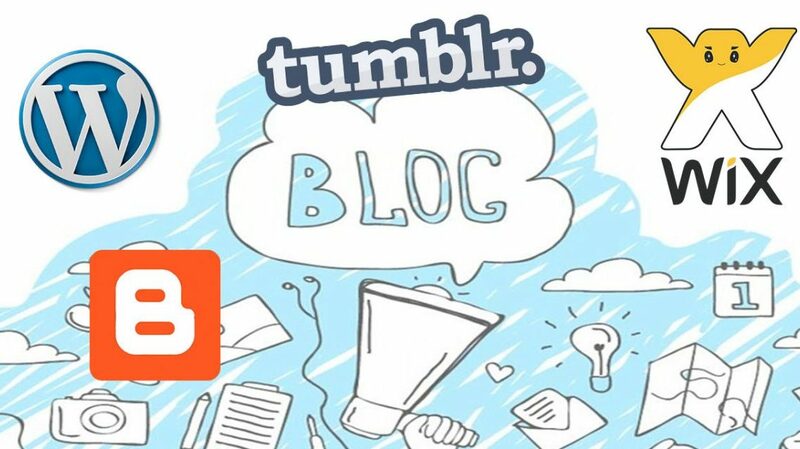 In this post, we are going to compare both platforms from different factors so that you can get a clear idea which one is going to be the best blogging platform for you. But before that let’s know a brief about their basic concepts, features, and functionality. A website builder is a drag-and-drop website building platform that allows users to create an eye-pleasing, professional website without using any web code. Most of the famous website builders are well-equipped with beautiful themes. WordPress is world’s most extensive Content Management System (CMS) powering more than 29% of the internet. It is quite user-friendly which lets you build any website or blog. Although the learning curve is a little tricky yet once you have a basic understanding of the platform you will be surely impressed by what it allows to achieve. Let’s begin the comparison battle! It is one of the most crucial tasks you should do before creating a blog. Make sure you have a clear understanding of the purpose of your blog. It will not only help you set the functionality and design of your site but also help you decide whether you can benefit from WordPress or Website builder. If you want to create a simple blog which will be used to share information and promote business then probably website builder is a good option for you. Such blogs don’t require too much customization. On the other hand, if you want to add more advanced features and functionality on your site, WordPress should be a more suitable option for you. In the modern software industry, ease of use is quite significant. If you are one who has some knowledge of HTML code, you will find creating a blog on WordPress exceptionally easy. It is true that learning WordPress can take much more time than a website builder, but by using themes and plugins you can remove the most of the coding requirement. Speaking of Website builder, it is a perfect solution for users who find using codes as a challenge. Most website builders offer drag-and-drop functionality that let users add different features and functionality to their blog via a highly visual approach. In the simplest words, a website builder is a perfect option for users who are looking to create a quick blog without any coding experience. In this battle, Website builder is a clear winner. When it comes to website building, flexibility matters a lot. WordPress seems more flexible than website builders. It supports various plugins which you can use to add multiple functions and features on your blog. Even if you have an idea for something, you can easily find a WordPress plugin for it. Countless 3rd party platforms offer free and paid plugins for WordPress. On the contrary, website builder provides limited flexibility as it comes with pre-designed templates, so the scope for customization is limited. We can say, WordPress has more advantage in this category. A well-planned budget helps you make the right spending plan for your hard-earned money. It plays a crucial role in choosing the right website building platform for your blog as well. WordPress is free to download and use, but you will need to buy hosting plan and domain name separately. A standard WordPress hosting plan should cost you between $3 to $10 a month. Numerous hosting companies offer free domain name with hosting. Whereas if see the average costing of some famous website builders, we find most website builder’s plan starts at $12 a month. Even this cost does not include domain cost, logo, themes, etc. We can say that pricing of website builder is much higher than WordPress. Moreover, like WP you can’t get the liberty to buy themes or plugins from 3rd parties. In short, with WordPress, you get the liberty to create your blog according to your budget. All the website builders come with hosting included; it means you need not to configure hosting separately. You just need to buy your domain name, and you’re ready to create a blog. At least that’s the thing with best website builders such as Wix, Squarespace, Weebly, etc. On the other hand, WordPress is installed on a separate MySQL & PHP web host. But there is an advantage with it; you can move to any hosting plan you find suitable for your budget and blog. It is not possible with website builders. You can’t change hosting of website builder without replacing the entire platform. Since website builders are quite user-friendly offer simple drop-and-drag methods to create a website, they can be useful options for people who want to get their online blog in the fastest manner possible. This kind of platforms are designed to build simple blog sites and company website; usually such platforms are not preferred for eCommerce stores, and large size content site and blog sites. With website builders, you can create a fully-functional blog within a few clicks. Moreover, you need not go through the hassle of buying hosting and setting up other technical elements of your blog. As said before, WordPress is a popular content management; many bloggers prefer this platform for blogging. Moreover, it is more focused on the content part and lets you build a full-featured blog. However, it takes little technical skill to build the blog you are looking for, especially for newbies. It would not be wrong to say; you can almost create any website or blog with WordPress. If you want to create a quick blog which is not heavy on the features, website builder is a good option for you. With most website builders, you just need to pick a template, edit the layout and drag and drop your content and hit ‘Publish.’ It is as simple as that! However, if you can wait to create a feature-rich blog and ready to grasp some basic technical knowledge, then you should go with WordPress. It will provide you more control over the feature and look of your blog. We would say, the best platform to create a blog depends on your budget, your aim (the purpose of creating a blog) and your technical abilities. If you want to build a large-scale business and want more control over it, then WordPress should be an excellent choice for you. Hopefully, this guide will help you decide which route you should take to create your blog. Which platform matches your blogging requirements best, kindly share your thoughts in the following comment section. How to Rank on Google (In Just 6 Minutes) with YouTube & Syndication Trick?